I’ll admit upfront: I have some misgivings about the 24 in 48 Readathon. Personally, for me, I don’t think it’s healthy. In the past when I have taken part and really tried to make it to the hallowed 24 hours goal, I’ve ended up having an absolute crap week after the readathon ends because my entire weekend was spent cooped up in the house, neglecting errands and housework and any other activity that wasn’t reading. I end up not eating properly, I end up not sleeping properly, and I end up not having the proper break that a weekend is meant to be. Therefore, I’ve recognised that sacrificing the 2-day break I get from work in order to just read isn’t completely healthy for me (but if it works for you, you do you!) so, this round, I’m not even going to try to get to 24 hours. Instead, I’m going to aim for 14 hours since I would work 7 hours a day and still have time to do other things without either being a detriment to the other. So, there we have it, less a 24 in 48 and more of a 14 in 48 – less impressive, I know, but hey, this is my readathon attempt and I’ll do it how I like! This is the book that I will likely be focusing on during the readathon. I’ve started reading it this week and it has been super fun so far and I have no idea where the story is going to go next so I’m itching to pick it back up and continue reading – there will be plenty of time to do that this weekend. I’ve set myself the goal of finishing this mammoth tone in 2019 so I’m making my way through it slowly. I still have a little bit to read to finish the section I’d like to have completed by the end of January so I’m including it in my TBR so I don’t forget about that! Whilst in the library picking up the book I mentioned above, I scoured the graphic novel section in search of some Loki: Agent of Asgard comic books that were allegedly on the shelves. I didn’t track them down (maybe they have disguised themselves as someone else? Would be about typical given their protagonist!) but this odd little book did catch my eye. I know nothing about it and barely even checked out the art style first to see if I enjoyed it so let’s just follow this whim and see where it takes us, shall we? Whilst scouring through the graphic novel section of the library I also found the second volume of The Wicked + the Divine and remembered that I’d read the first volume some time ago and had been intrigued about picking up the rest of the volumes in the series. I never got around to buying them because I wasn’t quite sure if I liked it and, hey, those bindups are kinda pricey, but I’ll happily take advantage of my library to puzzle out if I do actually want to read the series or not. Hoping to re-read the first volume and then continue onto the second one over the course of the weekend. Well, there we have it, that was my TBR for this weekend for the 24 in 48 Readathon. Are you taking part? Let me know in the comments if so, especially if you have a TBR because I’d love to be nosy and take a peek at it. Or, if you’re not taking part, still tell me what (if anything) you’re planning on reading this weekend. What’s this? Another foolhardy readathon sign-up post – yep! This time I’m participating in the 24 in 48 Readathon which is running this weekend, from 12:01 AM EST on Saturday 27th up until 11:59 PM EST on Sunday 28th January. The basic principle is very simple – you try to read for 24 hours within a 48-hour period. If my calculations are correct, if I waited to start reading at the official time of 12:01 EST that would be 5:01 am where I am over in GMT and, whilst I love readathons, not enough to wake up at 5am on my day off, I’m afraid. However, I am planning to go for this method anyway (over changing the readthon to be 12am my time) because I’ve never tried it this other way before and I suspect it might work out better for me. Plus, even though I’ve previously planned to stay up past midnight and start reading before going to sleep for a bit on Saturday, I never actually did that, so I suspect sticking with the official times might actually be better in the long run. We shall see! 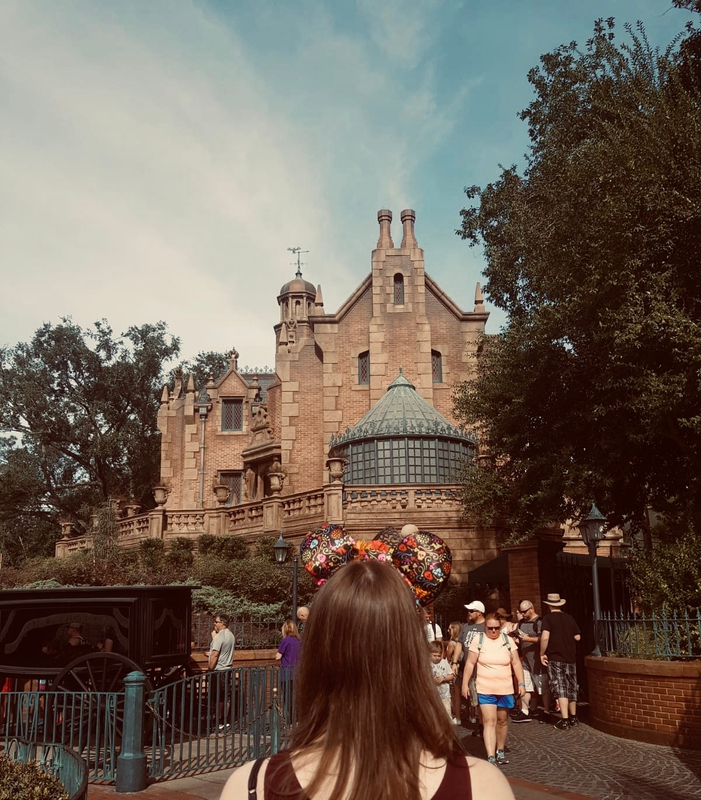 The folks who’ve been around on my blog for a while might remember that I took part in the 24 in 48 Readathon back in January and July last year and had a blast both times, with relative success during both! I like the idea of these shorter term readathons because they’re a quick and easy in-and-out sort of approach, with participants just trying their hardest to squeeze reading into their day(s) wherever they can. I like that attitude, and it has a great community feel too. However, unlike some of the uber dedicated participants, I’ve never managed to make it to the hallowed 24 hours, not even close at 14.5 and 16 hours respectively. So these days I tend to aim for a nice 12 hours of reading which, for me, on a weekend when I’m off and want to just laze about, is still pretty challenging. This round I’m aiming for 12 hours of reading again because everyone loves consistency, right? I probably had success in January 2017 because I had a range of genres and mediums to choose from and I’m a big advocate of that tactic during readathons in general, so I’ll definitely be doing that again this time. Are you participating in the 24 in 48 Readathon this weekend? Do you have your TBR all ready and are raring to go? Or have you participated in any short readathons in the past, like the Dewey’s 24 Hour Readathon? Let me know in the comments below and let’s chat readathons! As you may or may not have seen from my sign-up post, this past weekend I took part in the 24in48 Readathon and I had a blast. Well, tradition requires me to wrap-up my weekend of reading like a good book blogger and let you know how I did generally, as well as what I thought of the books I read during that time. I’ll try to keep it as short as I can! Let’s start off with the Big One – did I read for 24 hours? Nope. Not even close, to be honest. But I did get closer to 24 hours than I managed the last time I participated in this readathon back in January so I’m calling that a success. I read for 16 hours which is way more than I anticipated and I’m very happy with that! I’ve come to realise that for me, a person who likes sleep and WILL NOT sacrifice that unless it’s for a very, very good cause on her weekends off, I simply don’t prioritise reading enough to make myself sleep deprived. I also like to do sensible things like take a long shower and get dressed. So I don’t full commit enough to really squeeze every moment of reading out of the 48 hour period – so it’s no wonder I don’t make it to the 24 hour target but, you know what? I’m okay with that. In fact, I’m proud of my 16 hours. Not too shabby at all! All in all, I’d say that’s a success. I was very aware going into this readathon that I needed to make sure not to burn out during it because I’m currently participating in a War and Peace Newbies Readalong which, whilst only having a low page count to read each day, does require you to read every single day. I didn’t want to burn out and then end up falling behind with War and Peace because I’d over-read books during the weekend. But I think I’m good! This past weekend helped me to realise that I can read ahead with the W&P schedule and use my freed-up time to read some other books too, so that I don’t feel too disheartened with not having completed many books this month. Definitely something I’ll do more often during this readalong. As far as the books I read during 24in48 went, I thoroughly enjoyed everything I read. I suspected that I’d deviate from my TBR and I did – I know myself well! I blame The Art of Asking entirely for that because I was listening to Amanda Palmer and she mentioned her husband and then that got me thinking that I really wanted to read something Neil Gaiman soon – a few minutes later and I’d picked up Stardust. The other outlier, in the form of Ms Marvel was picked up due to necessity – I was out of the house at a BBQ on Sunday afternoon but I downloaded Ms Marvel Vol. 1 onto my phone via Amazon’s Prime Reading service so I read that in fits and starts during the afternoon. How’s that for maximising your reading time? All in all, a resounding success, huzzah! Did you participate in the 24 in 48 Readathon? How did you do? Comment below or link progress posts if you have them – I would love to hear about your weekend’s reading. Hello, welcome on this rather gloomy Friday, I bring you an exciting readathon sign-up/TBR post. For those unaware, the next round of the 24in48 Readathon is happening this weekend – that’s right, for the 22nd and 23rd July, for those 48 hours, the ultimate goal is to try to read for 24 hours out of that time. 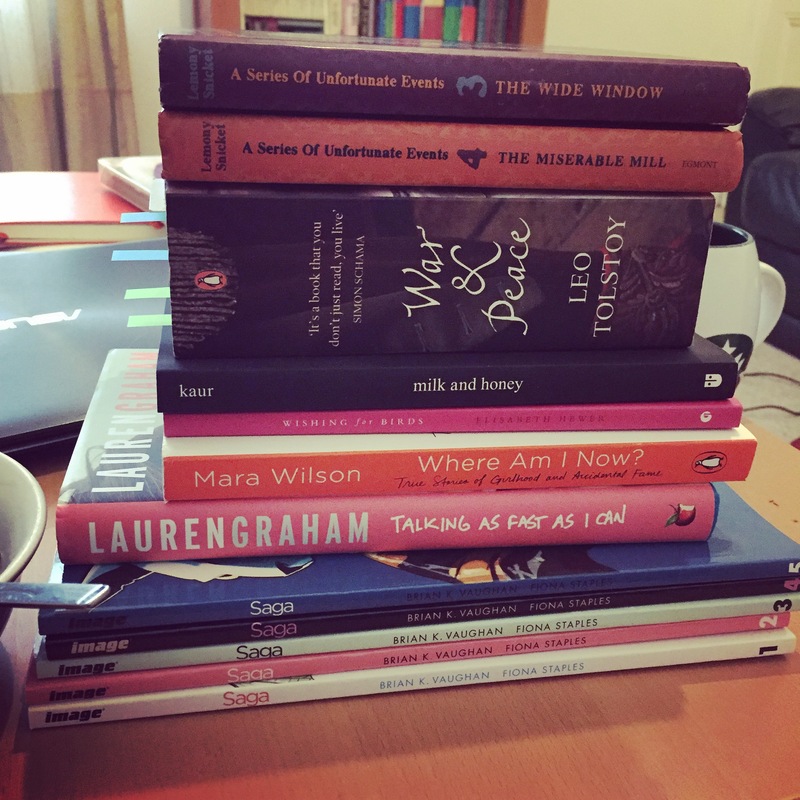 Last time, back in January, I really enjoyed the readathon and managed to read what seemed like a ridiculous of amount of books, even if I didn’t manage to read for the full 24 out of 48 hours. This round, I’m hoping to do better than last time. I’m still skeptical I’ll be able to make it to 24 because I need to leave the house on Sunday afternoon and that eats into valuable reading time, buuut I’m going to try my hardest anyway. & I’ll probably completely stray from that TBR and end up reading something completely different too. Are you talking part in the 24in48 readathon? Then please do pop in and say hi below and we can cheer each other on in this weekend of reading! If you’re not taking part, what are your plans for this weekend? What book are you planning to read and/or currently reading? Let me know below and let’s chat books! As you might have seen from my previous post, this past weekend I participated in the 24 in 48 Readathon. For those unaware of the premise, a quick summary is that you try to read for 24 hours out of a possible 48 hours i.e. Saturday and Sunday. Now, I knew going into this that I would never in a million years make it to 24 hours of reading, no way, I’m not that disciplined, frankly, and I also didn’t want to burn myself out on reading. However, I did want to make the effort to make reading a priority this past weekend and, on that front, I’d consider it a rousing success. Whilst I did watch some TV – Taboo could not be missed on Saturday night, and we needed to finish the final episode of Netflix’s A Series of Unfortunate Events – I mostly just read. When I got up and had breakfast, rather than putting on an old episode of Thick of It for the billionth time, I read instead, and I felt so much better and productive for it. Don’t get me wrong, I also spent the entire weekend inside, in the same chair, which made me a little cabin fever-y but nothing a week at work can’t cure, I’m sure. All in all – a very good weekend of reading and I’m very glad I participated in the readathon; I highly encourage you to try it out for yourself if you haven’t before! When is it probably the wrong time to participate in a readathon? When you’re reading a long af book like Tolstoy’s War and Peace. However, I’m still going to do it, because I’m curious as to whether I can actually get close to reading for 24 hours in 2 days – which is what this readathon is all about! For those who aren’t aware the 24 in 48 Readathon is just what it says on the tin – participants try to read for 24 out of 48 hours, over the course of a weekend. You can either start at 12:01am ET and use a time zone converter to find out what time to crack those books open where you are in the world or you can simply start reading at 12:01am in whatever time zone you’re in. Personally,I’m going to do the latter because I don’t fancy waking up at 5:00am on a Saturday. No, no way. I like the concept of this because there aren’t any goals besides trying to reach 24 hours of reading. I can never commit myself fully to the Dewey’s 24-Hour Readathon on account of the fact that I enjoy sleep too much but, the goal of reading for 24 hours of the course of a weekend, well… that I can try to do. I am under no illusions – I will probably fail spectacularly and only read for a few hours, but I’d still like to try, and I’d still like to track it because, if nothing else, it would be useful to know where my hours do actually go on a weekend! I’ve put together a stack of books to choose from, and I hope mixing up genre, format, and topic of book will help to keep my attention. I’ve also split my potential reads into short, medium, and long length reads, so I can mix it up when I need some instant gratification of being able to read a book in an hour. 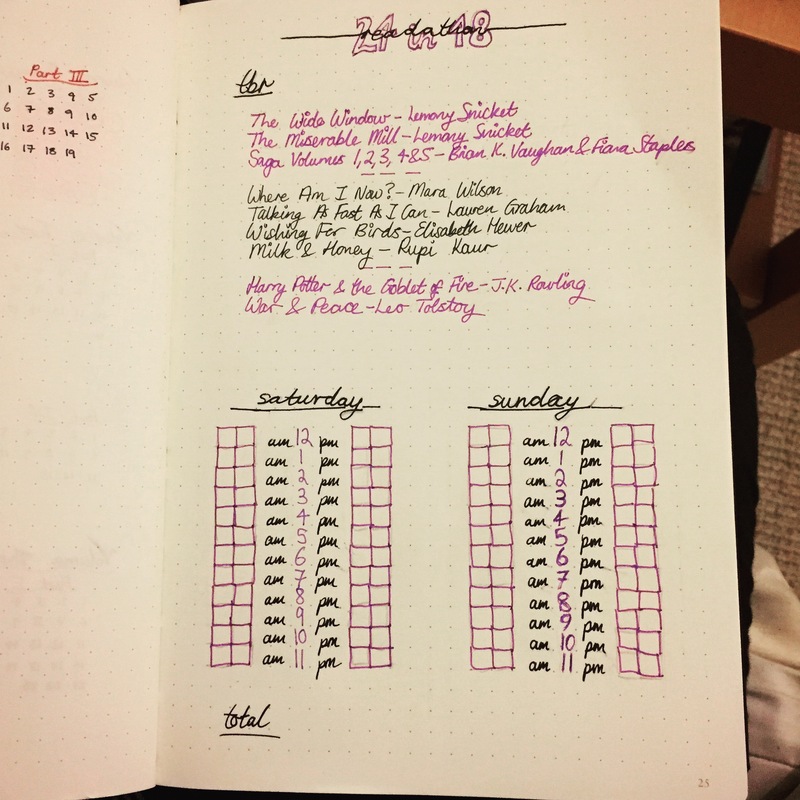 And, of course, this provides me with the perfect opportunity to put my bullet journal trackers to good use, I even created this one specially for the readathon thanks to the inspiration of Susie’s readathon tracker. So, I have books, I have time, I have snacks, I think I have everything I will need for the weekend and 24 in 48 Readathon. I’ll probably be updating via Twitter and Instagram so stay tuned there if you’re curious about how my reading is going. If you’re participating, let me know below! Otherwise, I’ll see you on the other side.